This revolutionary discovery, chronicled in the Science Advances was found about 40 miles northwest of Austin, Texas, and, once verified, may show that early peoples settled on the continent earlier than previously thought. A Texas A&M University (TAMU)-led team recovered numerous spear points, each three to four inches in length at the Debra L Friedkin site, named for the family who owns the land located in Central Texas. The site has undergone extensive archaeological work over the past 12 years, according to TAMU officials. Project team members on the dig also included researchers from Baylor University and the University of Texas. The spear points were made of chert, a sturdy finely-grained sedimentary rock composed of quartz crystals, is also known as flint. They were found under several feet of sediment. Preliminary dating tests revealed they were 15,500 years old, predating Clovis, the people who scientists believed were the first humans to enter and populate the Americas. Clovis crafted distinctive tools around 13,000 years ago, inventing the “Clovis point,” a spear-shaped weapon made of stone largely indigenous to Texas and northern New Mexico, although it is also found in other areas of the United States. The Clovis people used the weapons to hunt animals including mammoths and mastodons, from 13,000 to 12,700 years ago, according to the university. The study stated the team found roughly 100,000 artifacts including 328 tools and 12 complete and fragmentary projectile points below the Folsom-Clovis zone. Researchers, though, did not use the radiocarbon dating method to determine the age of the artifacts because “there were no carbon samples that would yield reliable and accurate ages” in the soil where they made the amazing discovery. Instead, they relied on a dating method called optically stimulated luminescence (OSL), capable of showing how long quartz grains in surrounding sentiment were exposed to sunlight. “There is no doubt these weapons were used for hunting game in the area at that time,” said Michael Waters, the expedition’s team leader. He is a professor of anthropology and director of TAMU’s Center for the Study of the First Americans. “These points were found under a layer with Clovis and Folsom projectile points. Clovis is dated to 13,000 to 12,700 years ago and Folsom after that. 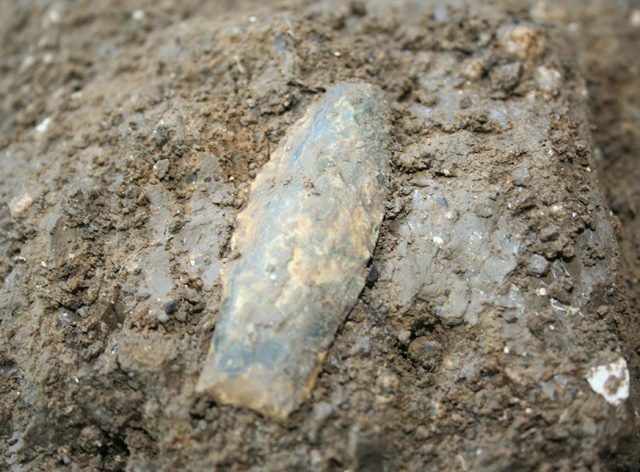 The dream has always been to find diagnostic artifacts, such as projectile points, that can be recognized as older than Clovis and this is what we have at the Friedkin site,” said Waters. Exactly when and how the first people reached the Americas remains a mystery. Many scientists agree that the first Americans left northwest Asia and southern Siberia between 25,000 and 20,000 years ago crossing over the then-existent Bering Strait land bridge, according to Live Science. However, experts disagree on how long they stayed in the region known as Beringia, another name for the Bering Strait land bridge.